It is difficult to imagine another element so central and so vital both to basic life and to a diverse range of aesthetic and recreational pleasure. The use of water in the built environment is thousands of years old and is interwoven throughout its long history with symbolism and religious rites as well as with sensual delight. Aqua landscapes or Water Gardens, as they are known, have been prominent in English Imperial Gardens, French Baroque Gardens, Chinese Classical Gardens as well as the Moorish Royal Gardens. 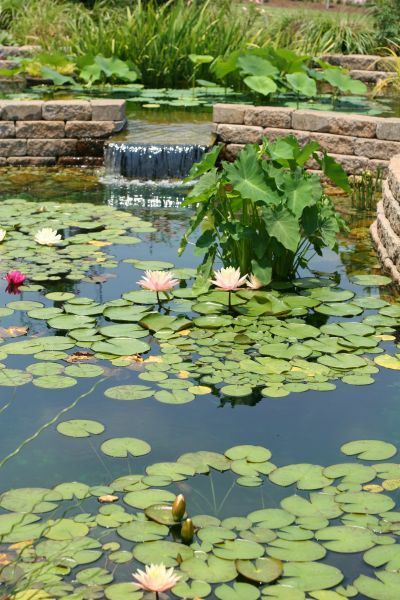 Water Gardens typically include the integration of artificial ponds, streams, waterfalls, statues, rocks, aquatic plants, fishes, watercourses and fountains with the natural surroundings and environment in order to create a pleasing atmosphere. Water gardens have been designed for thousands of years for a variety of reasons and it has produced outdoor fountain pros in every era. Here are a few interesting applications of water landscapes. Served as a source of potable water endowed with medicinal, legendary properties. Highly developed by the Romans. Derived from the Greeks. Serves as a vehicle for obligatory cleansing before entering the mosque or a temple. Appeared in renaissance. Centerpieces for plazas, courtyards and intersections. Commissioned by the Pope or King to perpetuate his memory. Only at a fairly gross level, one can sort into categories many of the uses of water in design. Even then such classification inadequately describes the full reality and the parameters of the areas so defined. Surge or wave action can be created. Prohibitively expensive mechanical systems required. Water used to turn sculpture. Water effects with water pressure. Economics and vandalism cannot be ignored. Utilitarian projects can be expanded to exploit water as a recreational tool and educational tool. Constructed over concrete slab roof deck. Water in motion by underwater jets. Structural requirement to be worked out at preliminary design stage. Periodic maintenance for watertight conditions is a must. An Aquatic landscape designer might modify and manipulate the naturally occurring features in a given place to improve its visual attraction. Artificial ponds might be dug up, new watercourses might be plotted, aquatic plants and fauna might be used to integrate the place with nature. Artificial waterfalls and fountains might be erected, which act as a cooling oasis in the summer season. Design of water gardens is a way to bring nature closer to human beings, to add beauty and serenity to the landscape. Today, with the ever increasing human population, the world faces a terrible shortage of resources, including water. Hence, an important part of water gardens in landscape architecture is recycling and reusing water, as well as limiting the wastage of water as much as possible. Breakthroughs in indoor water fountains for home have given garden fountains a chance to be eco-friendly, technology has that power, we just need more people focusing on such things. Lower water bills from reduced water use. Conservation of natural resources and preservation of habitat for plants and wildlife such as fish and waterfowl. Hence, water recycling, pumping and storage is housed in the facility to decrease dependence on external water supply. The water in ponds, fountains and watercourses is periodically replaced as it is moving water, thus preventing the growth of algae or mosquitoes. It keeps the climate cool and serene. Hence, water gardens nowadays play an important part in the landscapes of mansions where they are integrated along with swimming pools and gardens. This entry was posted by Benzu JK on February 8, 2010, 8:21 pm and is filed under Landscape. You can follow any responses to this entry through RSS 2.0. I ma trying to sort out my own litle water garden but nowhere the size of the picture above. I always wished I could have a pond and maybe keep some fish in it. Water gardens really do add to the beauty of a place so if you can get it done, do so and it will brighten up your days no end. Thanks for this post it gives me lots of idea. God Bless! Wow, I love the pictures in this article. Thank you for this information. Just think how great it would be to be able to fix a wonderful breakfast and then go sit out by your own private water feature enjoying the best in life, good food and nature. 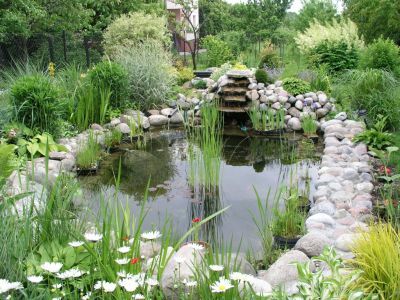 Some people may take their hobby as making garden pond in their gardens,which enhance the appearance of garden and house.Now a days not only the high level people but also people in the middle class prefer to make garden with garden pond.Valuable information to those people. I always adore garden with pond. It is a great focal point. Makes the surroundings calm and relaxing. Those are not your average size garden ponds though! They are so tranquil I could sit there for ages if was situated in a peaceful location.